Ø§Ù„Ø±Ø¦ÙŠØ³ÙŠØ© / mobile / new tech / Launched on 14 March, Samsung S4 octa-processor announcing explosive ! Launched on 14 March, Samsung S4 octa-processor announcing explosive ! 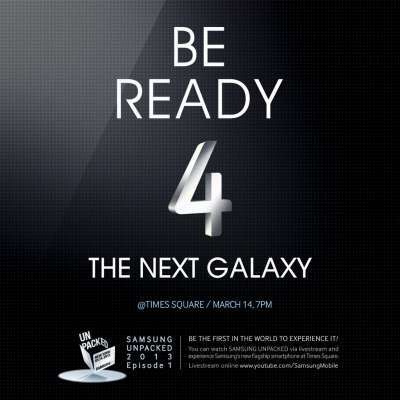 The fans certainly have already reserved their night of March 14 to 15 to see live from New York the new smartphone Samsung S4. A first benchmark seems to confirm features and impressive performance. Samsung has not been stingy with the latest ads MWC Barcelona: Galaxy Note 8 (tablet-phone), announces the first mobile OS under the Open Source Tizen, alliance with Visa or advertisement for the NFC environment KNOX for more secure Android mobile devices. But no question of its future flagship model walnut smartphone, the S4, in the deluge of presentations show Catalan. To discover the S4, it will wait a few more days. For the official launch is scheduled in New York on the evening of Thursday, March 14 with the immense scope for Radio City Hall. The countdown is underway, and the Korean manufacturer now begins its communication campaign with the first of a series of teaser videos that you can find below. And the first benchmark AnTuTu on a copy of which appears for the international market portends exceptional performance about 50% outperforming those of his elder S3.